"The Gold Star staff are always very nice, and helpful"
Located in the heart of historic downtown Bryan TX, just minutes away from the Texas A&M University campus, you will most likely be greeted with a "HOWDY" and "GIG 'EM". Bryan - College Station Texas is one of the most friendly and diverse communities in the great state of Texas. We've got the big city atmosphere with a small town charm, making you feel right at home. Gold Star Finance is proud to be a part of the Bryan - College Station TX community, proving short term consumer loans with the Bryan TX area. 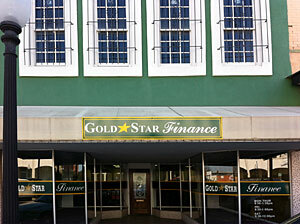 Stop by our 113 N. Main Street location so we can get to know you better. You will always be treated with courtesy and respect.